Did you know that as a homeowner you’re responsible for maintaining your septic system? 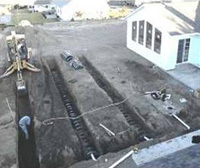 Did you know that maintaining your septic system protects your investment in your home? Did you know that you should periodically inspect your system and pump out your septic tank? If properly designed, constructed and maintained, your septic system can provide long-term, effective treatment of household wastewater. If your septic system isn’t maintained, you might need to replace it, costing you thousands of dollars. A malfunctioning system can contaminate groundwater that might be a source of drinking water. And if you sell your home, your septic system must be in good working order.